Icaros Inc., a leading provider of aerial remote sensing services and software, has announced that Harris Geospatial Solutions, a division of Harris Corporation, will offer the Icaros OneButton™ family of image processing software as a front-end complement to its ENVI® geospatial analytics solution for users extracting information from manned and unmanned aerial sensor data. 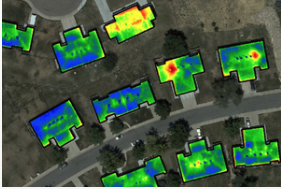 “The combination of OneButton and ENVI provide best-of-breed, application-specific image processing and analytics, that enable customers to solve challenging problems related to everything from agriculture and forestry to utilities and city planning,” said Beau Legeer, Business Lead, Data Products at Harris Geospatial Solutions. OneButton automatically processes raw raster imagery with onboard GPS/IMU data to stitch the individual scenes together into a seamless, color-balanced orthomosaic meeting photogrammetric standards. Outputs include digital elevation models (DEMs), true color 3D point clouds, multispectral mosaics and controlled oblique imagery—all ready for ingest directly into the ENVI software environment. The OneButton family includes a Standard and Professional version. The Standard package asks the end-user to specify the application and terrain type for the project at hand. The software then intuitively sets parameters of the photogrammetric engine to perform the mosaicking to the level of precision required. For example, the processing algorithms would handle flat agricultural fields different from a rolling urban landscape. “The Professional version is more customizable, allowing end-users to adjust the processing parameters themselves based on the precision they need, and then edit the resulting mosaic to remove anomalies, like an airplane moving down a runway. OneButton Professional was specifically designed to generate results with the efficiency and accuracy necessary for large scale projects and survey-quality results,” said Bosanko. The OneButton solution for ENVI is available now to existing and new customers, and both companies expect further technology integration in the near future around cloud enablement of the UAS data processing and analytics workflow.